Debbie was so generous to give me a box of beautiful tomatoes! (Thank you Debbie!) She provided me with the picture above outlining the different varieties she gave me. This salad is a take on the traditional caprese salad. Consisting of a few of the tomatoes above (specifically the Mr. Stripy, Marremano and Ruffled Red), I layered the tomato slices along with fresh mozzarella cheese and drizzled some homemade basil pesto over the top. A light splash of olive oil, salt and pepper finished the dish. It's so simple and colorful, what's not to love? Use whatever tomatoes you have on hand and make use of those beautiful tomatoes that are currently in season! 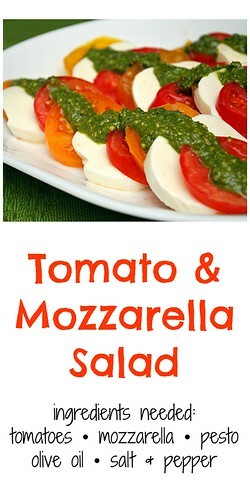 On a serving platter, arrange the tomato and mozzarella slices alternately in rows. 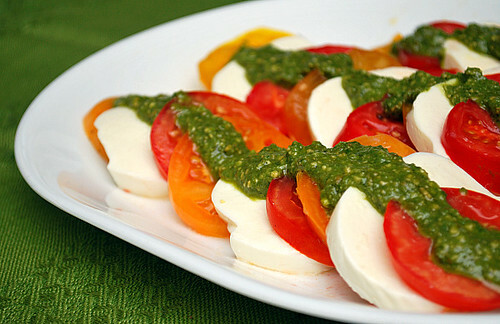 Once your platter is full, drizzle the pesto over the top of the tomato and mozzarella slices. Drizzle the olive oil over the entire dish and season with salt & pepper to taste if desired. Place all the ingredients in a food processor; pulse a few times, then process until fairly smooth, or to the desired consistency, scraping down the sides occasionally. Variations - You don't have to use basil. I've also made pesto using fresh sage leaves, oregano, and/or thyme either on its own or in a combination. You can also use other kinds of nuts such as walnuts, pecans, almonds, cashews, etc. Pesto is very versatile and can be made to fit your tastes or whatever ingredients you have on hand. Joelen, glad you enjoyed the tomatoes and thanks for the kinds words. Chicago is lucky to have you bring our food community together. See you at another meetup soon! Thanks for the beautiful picture and yummy recipe. I just made something similar last week but with more herbs and some chiles too. I normally grown many types of heirlooms every summer but this summer I cut down to 3. They are always so pretty and tasty. 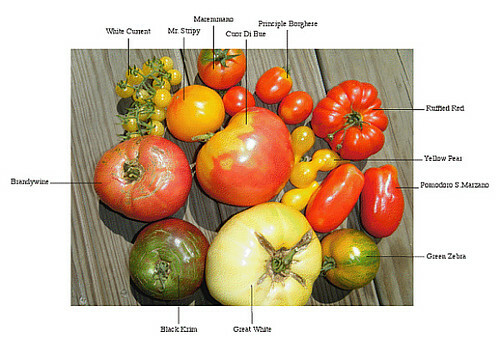 I never knew there were so many varieties of tomatoes! This is a great looking salad too, nice work and congrats on Top 9!